The Blue Winged Olive Mayfly is one of the most prolific mayfly families in the United States and can be found on rivers and streams at every elevation and in almost every state. This mayfly family will often have two generations per year, with large hatches occurring in both the spring and fall with a few early bloomers coming off in between. Our Blue Wing Olive selections have been crafted to allow the angler to take advantage of and fish every life stage of this important mayfly species (Nymph, Wet Emerger, Dry Emerger, Dun, Spinner, and Spinner Fall). 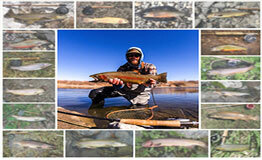 The Small Selection will touch on the dominant life stages and includes 6 dry fly patterns and 6 wet fly patterns. The Medium Selection will expand upon both the dry and wet life stages and includes 10 dry fly patterns and 14 wet fly patterns. The Large Selection will flesh out this vital trout food, covering every life stage and includes 15 dry fly patterns and 21 wet fly patterns. The X-Large Selection exhaustively covers the life cycle of the BWO Mayfly, ensuring that you will have the flies you need for both the spring and fall hatches, and includes 20 dry fly patterns and 28 wet fly patterns. Just as told for the afternoon/evening hatch, the bigger trout went crazy for the midges under the water...best fishing trip in a long time!